The ‘building’ was untouched. What burnt down was a pandal in the grounds of the building, which is constructed of bamboo sticks & canvass. Please note the word ‘alleged’. The allegation has no basis in fact. The costs for the court case have so far amounted to no more than $8000 in total, which have been funded entirely from donations from the West. Funding an action in rupees, with funds from the West is relatively easy, since $1 = 44 rupees. To put this into perspective, for our upcoming meeting in New York, just one IRG member, who has his own business, and who is attending from another western country, will spend over $1000 just on his ticket. So to raise the funds for the court case is not difficult. This was already pointed out before in our original press release on this subject, but due to the desperation in needing a ‘story’, a false allegation needs to be recycled. Since the pandal was old and due to be replaced, its value is only 15 lahks. Further as Hari Sauri well knows, in India the next 4 months is off-season for Weddings, and therefore the loss in income is ZERO. Thus in that sense, this was the ‘best’ possible time that such an unfortunate incident could have occurred. Since the pandal was burnt down not by Lord Jagannatha but by an act of arson, by an enemy of the IRG, Lord Jagannatha is merely telling us to be more vigilant in future, and to not assume that those who oppose the IRG would not stoop so low as to engage in arson. But in the desperate and twisted world of Hari Sauri’s logic anything is possible. By the same reasoning, the beating up of Radha prana prabhu in Malaysia would also be a ‘sign’ that the Lord is trying to ‘tell’ us that the IRG is wrong. To those of us who are more reasonable however, it is simply a sign that those followers of HH Jayapataka Swami are just thugs. Persuading a communist Judge to give us the route for the parade, even though the Judge had initially sided with the Police, who had wanted to severely restrict the festival. Attracting 1. 5 million people to the Ratha Yatra making it one of the biggest for years. Attracting over 100, 000 persons to our evening pandal program, a new record. Putting our pandal up in 4 days, even though we had heavy monsoon rains, and the task normally takes 21 days which includes a 60ft. high temple for Lord Jagannath. We had about half a million dollar of television & news coverage. We distributed over 40 tonnes of prasadam. In sum giving us the best and biggest Ratha Yatra for many, many years. And this was the first year that the devotees from Mayapur did not assist in the festival. Indeed they did not even attend. If unfortunate incidents are evidence of anything, then Hari Sauri needs to look in his own backyard, where the trail of misfortune and destruction makes the burning down of one bamboo structure insignificant. CHAKRA (Calcutta, India) – July 24, 1999: The building used by the Calcutta temple controlled by Adridharan dasa for conducting weddings has burned in a fire. The fire took place on the morning of July 15, the day after the Calcutta Rathayatra, at about 4 AM. The building was used as a wedding pandal. It is located at 22 Gurusadaya Rd. It is alleged to have generated funds which were being used to pay lawyers trying to sue ISKCON. Although the building is repairable, the damage will set Adridharan back approximately 40-50 lakhs of rupees (US $120,000) plus whatever income was to be generated from its use. “It seems that Lord Jagannath is trying to tell him something. Whether he will listen is another thing,” reported Hari Sauri dasa. Recently His Grace Hari Sauri Prabhu tried to discredit a story run by IRM, by claiming to reveal the real ‘facts’. Since I was the person to whom he originally sent the incriminating e-mail in question I feel obliged to reply to his mis-leading statements. Unfortunately his so-called ‘facts’ are totally misleading. Quotes from Hari Sauri are boxed in inverted commas, my comments following. The IRG – ISKCON Reform Group – is NOT an ‘anti-ISKCON web site’, but a pressure group composed of ISKCON members who wish to reform the society in line with Srila Prabhupada’s desires. How that makes it ‘anti-ISKCON’, especially since Hari Sauri himself agrees that the society needs to be reformed, is hard to fathom. Does Hari Sauri consider himself anti-ISKCON too, surely not? Also since Hari Sauri, along with myself and many others, have been completely wrong regarding the guru systems that have been tried in recent ISKCON history. We allowed the ‘zonal acharya‘ system, which everyone now agrees was a terrible mistake, and which was itself replaced with the M.A.S.S. (Multiple Acharya Successor System); a system which the GBC now admit also needs to be reformed; it would be better if he exercised more caution in writing off IRG’s position as anti-ISKCON so readily. 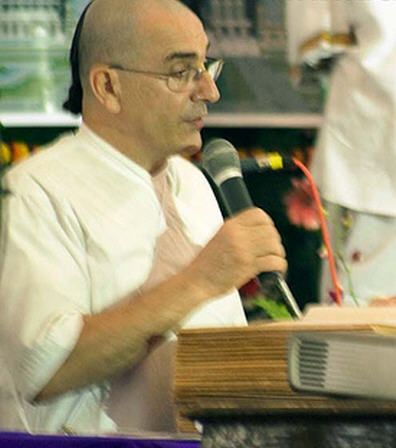 The one thing we do know for sure is that whatever systems we have backed for the last 21 years have definitely been against ISKCON’s best interests, and that is why the GBC are at present hastily trying to cobble together a new system. IRG has never ‘pilfered’ any e-mails. Pilfering means to ‘steal’ and that has never been done to my knowledge. Could Hari Sauri give just one example of IRG pilfering? All e-mails are voluntarily passed on to us by enthusiastic supporters of the ISKCON Reform Group. The e-mails Hari Sauri refers to, which were published on IRG, were all accurate and true, as has been admitted by Hari Sauri himself, and were thus not sent in by ‘untrustworthy informers’. In regards to the story in question – the funds given to Harikesha – Hari Sauri admits that the information printed WAS all correct. His complaint only related to the way in which the information was obtained. Yes, IRG does rely on the mercy of our GBC ‘informants’ and others. But in this particular case there was no mistake – Harikesha did receive the funds, at least $500,000 – and this was all that was claimed. After criticising IRG’s lack of access to ‘proper information’ etc,. here Hari Sauri Prabhu himself again admits that the funds were indeed given to Harikesha! IRG never stated that it was the GBC who gave the funds, nor was it stated that the funds were disbursed before or after a certain point in time. The main concern was not precisely by whom or when the funds were given, but that the funds were somehow given. ‘We here at Chakra are committed to telling you the WHOLE truth. We don’t hide anything, although we have our own perspective, which is independent and not dictated to us by the GBC’. Would CHAKRA agree that failing to mention the disbursement of at least half million dollars in the context of concerns that funds had been given to Harikesha IS mis-leading and not the ‘whole truth’, and is definitely ‘hiding something’. A false statement made with the intention of deceiving. Financial dealings may indeed be complex, but omitting to tell us that very recently at least 1/2 million dollars had freely been disbursed from the Visva Tosani funds to Harikesha is very simply an act of deception. I find the above accusation a bit rich, seeing as we have both (Hari Sauri and myself) supported bogus leaders in the past, and posed ourselves as something we were not, which is after all the very definition of the word charlatan. Yet in this instance Krishnakant prabhu is guilty of nothing more than disclosing this shocking misappropriation of funds. How can stating the truth be an act of ‘dishonesty’!? Why should IRG apologise for revealing this information to the devotees at large, since they have every right to know what happens with Srila Prabhupada’s laxmi. The real ‘dishonesty’ lies in Hari Sauri Prabhu wanting to keep this information from the Vaisnavas. Since this highly relevant information was only revealed by Hari Sauri because he somehow mis-read my name ‘Bhaja Hari Das’ as ‘Braja Bihari Das’, it is quite conceivable that it was indeed Krsna’s arrangement. As seen above $500,000 was given to Harikesha STRAIGHT, not in any ‘bent’ fashion. And the only reason we know about it is because Hari Sauri Prabhu inadvertently revealed the truth in his e-mail to me. As regards the guru issue, one only needs to read ‘The GBC Fails to Answer The Final Order’ and ‘Time Out For Hari-Sauri’s Minutes’ to see who is ‘bending the truth’. Indeed Hari Sauri is apparently so bewildered that he still thinks that the ritviks were appointed by Srila Prabhupada to absorb karma on his behalf even whilst His Divine Grace was still physically present. So confused is his understanding that it is not even shared by the GBC, the very body he is vehemently trying to defend. Hari Sauri now seems to be so desperate to try and attack IRG that he quotes something which is not even on the website! He therefore finishes in the manner he began – misleading and misrepresenting. Since it is undisputed that Harikesha has acquired at least half a million dollars of Srila Prabhupada’s laxmi, and since the GBC admit that this is a violation of ISKCON law (and almost certainly criminal law also) what is the GBC’s executive committee doing to retrieve it ?